I stard the vector on sai, made outlines and go, dora, go to psd UAUASUHSA' forget it. Anyway, i made the coloring and other detals on psd, for vector i used: pen tool, selection tool, erase, brush, filter, gradient map. 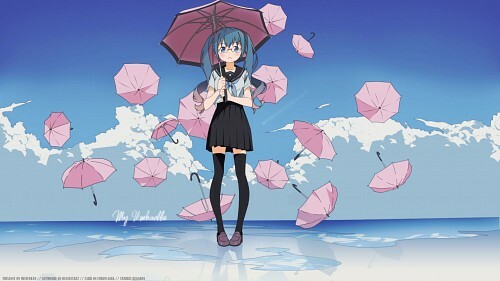 The scan was smart, so i increased the number of umbrellas, recreated part of the sea, sky and clouds. The effects i used contrast and light. The star i made with brush and filters like: noise and blur. To shadows did not made do much. So, is that. Well, hope someone like this. Looks good. Although, I think the umbrella shadows need to be blurred a lot due to distance from the ground and in the back. Love you girly for making such a Cute wall! I agree with Val about the centering of the character. I disagree about blurring the sahdows. Everything else is sharp so I think the shadows can stay sharp, too. For some reason, I really love the color palette and the combination of blue and pink. It's neither too dull nor too flashy. Would maybe add some birds in the distance but it looks great nonetheless. Oh hell no! Don't listen to them (by them i mean @elisa & @val). Centralization is cool and all but damn way too overrated. Offset is the way to go! Sometimes you just gotta break the (design)rules. The tracing look really neat and I love the color palette. The extension looks good, nothing seems to be out of place. I love that you stayed true to the original scan and preserve the charming simplicity of the design. If you do want to add some birds, as per elisa's suggestion (or to add anything else really), keep in mind that too much mucking about would make it a messy affair. The only complain that I have is the text, "my umbrella". It's really not necessary to add text. You don't have to feel obligated to add one just so it will be a more legitimate wallpaper. I agree with dad(@wildrose). You shouldnt worry too much about making your pieces perfectly center. Setting it a little off center does give it a more personalized feel imo. I totally agree with @Val about the centering issue for this wall. I think it will give the visual balance that this wall needs, if you notice the right side is quite off. I would also like to agree with @wildrose about the typo that you've got here, it quite unnecessary to add it here. Overall, it nice and I'm hoping to see more walls coming from you. Very nice idea with the umrella.